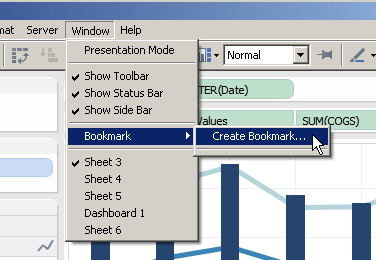 The functionality is well hidden under the name "Bookmark" - but Tableau actually has the ability to "Copy sheet to another workbook" as it is known from Excel. I use this when I want to reuse visualizations in other workbooks or when we are several people collaborating on one dashboard. Save the file on your computer (it will look like an ordinary Tableau file with a red ribbon). Go to file and "Open" the bookmark in the workbook where you want to paste the Tableau file. Make the bookmark function available for dashboards also in version 8 I am only able to bookmark sheets - vote for the idea here.